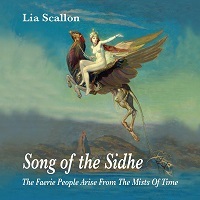 There is much history and much mythology that I know little about, but a newly discovered chapter of that history comes forth on the latest release by Lia Scallon called Song of the Sidhe. Through Lia's enchanting music I learned about the High Queen and King of Ireland and the people Under the Mounds. She offers stories about fairies, warriors, singers, and most of all, magik. I learned much of this supernatural world as I listened to the eight tracks of Celtic/World music. So much so, that I believe that the magik is still alive and strong and there for all to find. Lia Scallon is an Irish born, award winning composer now living in Australia who gave us the renowned 'Songs of Sirius' Series, a collection of music with her signature vocalese created by emotional and spiritual stimuli within the music, a wordless language that suggests a connection to many worlds. Song of the Sidhe is her eleventh release. In a voice that is both majestic and clear, Lia, in her persona as the Queen opens the album with an introduction backed by swirling synths and sparkling harmonics called Song of the Sidhe Queen. She is Tea Telphi and in spoken word, she introduces you to her hidden world. The background is dramatic music, but the Queen commands center stage as she reveals some of the rich histories of her tribe, the Tuatha De Danaan. In Queen Tea's Plea, she implores the humans to once again recognize her realm. Scallon's voice has the resonation of signing bowls; that unique flow of sound that feels like the rings formed from a stone thrown in a still pond. Her crystalline voice resonates outward and into your psyche. King Heremon's Return is a chant with strong drum and piano. Queen Tea calls to her king to return to her and aid her in unlocking the passage to the upper world. The next cut, The Faerie Portal Opens, literally offers Lia's beautiful wordless intonation as the key that opens the gateway. Soft violin by Christine Jackson caresses the song, while the vocal floats in the air like some diaphanous mist. Rising of the Sidhe is a triumphant return for the People under the Mounds. The tune is a march of the fairy people as they emerge from their underground refuge. As thousands surface, each member revels at the power of sunlight and the freshness in the air, but it is the warmth of the day along with their freedom that cheers them. Lia's voice, backed by flute (Shakimra) ascends almost like a prayer. Much of the journey of Queen Tia and King Heremon is defined by their search for the Diamond, a prize that promise everything to the beholder. They finally find it in a special place, The Enchanted Crystalline Lake. The discovery is an opportunity for a celebration. It starts with a whisper as Lia's vocal merges into a soft, angelic ballad. I can imagine the waters swirling and bubbling. I can catch a glimmer reflected off the faceted jewel as it rises. The jewel vibrates and the frequency offers peace and tranquility. It is a phenomenon that is felt throughout the album. The Stone of Destiny is found, the stone on which kings are crowned, and it offers power and guidance. Lia's vocalese is melodic and vacillating on the tune by the same name. There is a hypnotic effect to the music with its undulating synth background and haunting flute lead by Nigel Pegrum. You can feel the magic. The final tune is called Tara's New Reign. The Queen is once again on her throne, the balance between men and fairy equalized, and the worlds of both begin a new alliance. Banished by the by the Sons of Mil after the Battle at Tailtiu, the Tuath De Danaan became the People of the Mounds. The underworld dwellers. Lia Scallon, within eight tracks of ethereally blissful music has managed to tell a tale of their restoration that has been centuries in the making. This is a record that you can put on and just disappear in the music, whether you be human or fairy-folk. On all tracks the music is lush and warmly textured. The story, timeless. This album is highly recommended.